Water bills could soon soar by $38 as the drought causes dam levels to plunge dramatically. Despite recent rainfall in Sydney, 98.9 per cent of New South Wales is still in drought and could trigger a radical measure never tried before. Dam levels in the Sydney catchment area are alarmingly low, with the Tallowa reservoir on the south coast down to just 23.2 per cent capacity. 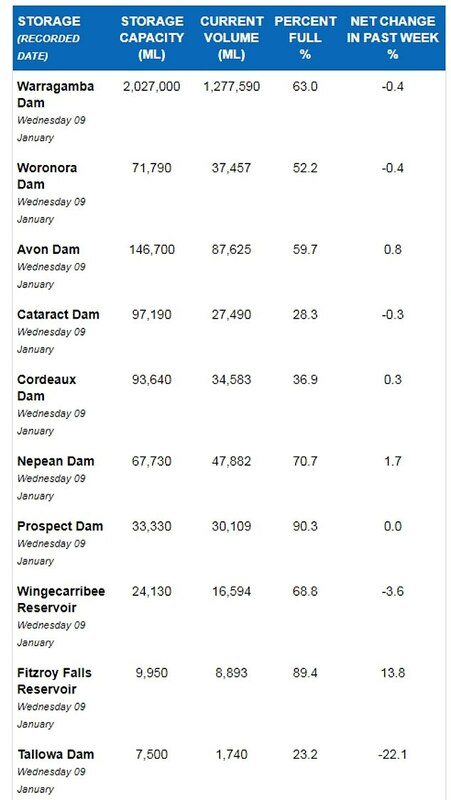 Average levels across 11 dams, catering for five million people, have fallen to just 60.9 per cent and have dropped by 0.3 per cent during the past week alone. Capacity at the main Warragamba Dam, on Sydney’s western outskirts, has fallen to just 63 per cent. If dam levels collectively dropped below 60 per cent, Sydney’s desalination plant at Kurnell would automatically be turned on. This would cause annual water bills to surge by $38 as the plant, which turns seawater into freshwater, was used to combat a drought for the first time since it was built in 2010. The Liberal Party opposed the construction of the desalination plant in 2005 when then Labor premier Morris Iemma announced it would be built ‘drought or no drought’. Now in government, the Coalition’s Utilities Minister Don Harwin has indicated the desalination plant on Botany Bay would be turned on if dam levels continued to fall. ‘Sydney will always debate whether it’s a good investment, but the fact is we’ve got it and now it’s a bit like an insurance policy,’ he told the ABC on Wednesday on the sidelines of the Sydney Festival. The desalination plant cost $2billion to build and has continued to be a drain on the public purse, even though it hasn’t been operational. The NSW Independent Pricing and Regulatory Tribunal estimated the dormant desalination plant cost ratepayers an average of $87 in the 2017-18 financial year. Were the desalination plant to be turned on, as dam levels fell, ratepayers would have individually paid $125. This would cause annual water bills to surge by $38 a year.